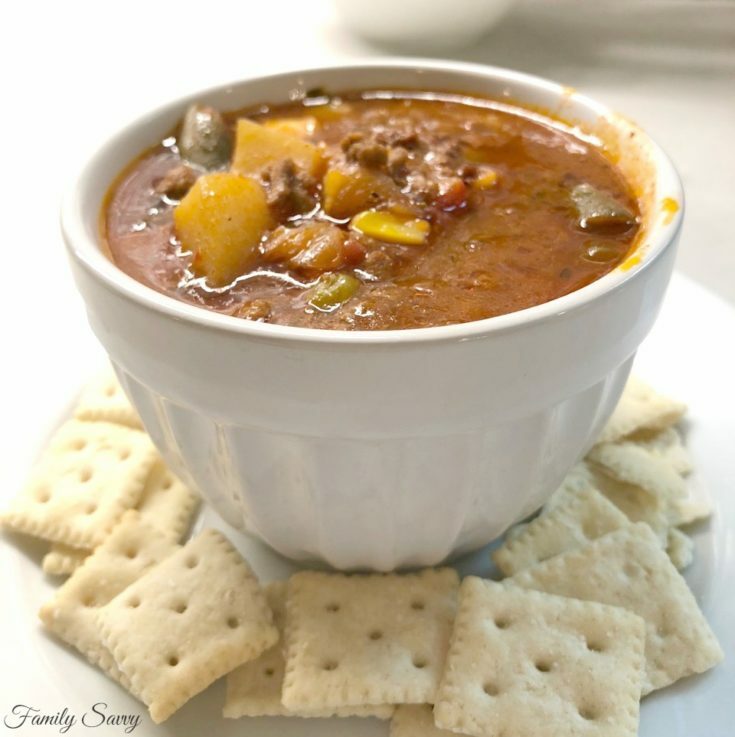 Spicy hamburger vegetable soup is bursting with flavor and kick but can easily be adjusted for those with milder leaning taste buds. Spicy hamburger vegetable soup is anything but boring. The seasonings and condiments in the recipe add zest, flavor, and heat for those of us who can’t get enough kick. For those who prefer milder tastes, adjusting the recipe is advisable. Note: If using a bag of frozen vegetables, I sautÃ© them for a bit with the browned meat so that they will soften a smidge before adding to the slow cooker or soup pot. I always cook potatoes (Simply Potatoes or fresh) in a microwave steamer pouch before adding to the pot; otherwise, they will be hard. I use these steamer pouches which can be found at most grocery stores. This can be made on the stovetop or cooked on low 7-8 hours in a slow cooker (my preference). Leftovers are actually better the next day, as the flavors have a chance to blend. I make this early in the week and get several meals out of it. This can be served with saltines but our favorite accompaniment to this is jalapeÃ±o pimento cheese cornbread. So good and comforting! I’d love to hear from you if you try this. As always, thanks so much for stopping by. Be blessed, and stay savvy!!! Put ground beef in skillet, season with sea salt & ground pepper, and cook over medium heat until almost brown. Add garlic the last minute or two of browning. Remove from heat; sprinkle dry onion soup on top. Pre-cook potatoes and carrots to almost done. I use Ziploc Zip 'N Steam bags and cook 4 minutes on high. Add butter to potatoes and carrots; let sit until butter melts. Stir potatoes and carrots until coated with butter. Add potatoes, carrots, and green beans to the skillet with meat. Sprinkle vegetables with salt and lots of pepper. Add all remianing ingredients - bring soup to a boil. Reduce heat, and simmer at least an hour. May transfer to a slow cooker; cook on high 4 hours or low 7 hours. Thanks for letting me know how you adapted it, Gail! We like ours thicker, but I’ll be some folks might prefer it thinner~thus more beef broth would be better. So glad you enjoyed it!!! Thanks for commenting back. I saw the update! I guesstimated about 4 cups of beef broth and two bay leaves and my family loves it!! I also added can of corn for a bit more color and as I said the family loved it. Thanks for the inspiration! Hey Patti! I add the onions to the meat during browning. I usually use the diced frozen onions, and they do great just added to the skillet with the meat and cooked until soft. They cook the rest of the way while the soup simmers. Hope this helps!!! Hi Patti, I am so sorry that I left this out. It is now corrected:-) Use 1 (14.5 oz) can beef broth. Thanks for commenting. Hope you enjoy the soup! Hi Gail, I am so sorry!! 1 can (14.5) beef broth and 1-2 bay leaves. Corrected; thank you for commenting! Hopy you enjoy! Bay leaf and beef broth not on list of ingredients. How much? I was in middle of making this and now I’m gonna be guessing. How much beef broth is to be used in this recipe?